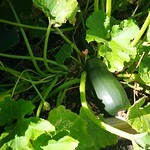 I planted one other zucchini along the back of the house, and it seems to hate it there. It may be dead. On the other hand, the two I planted in the "hell strip" are thriving.